Real Madrid substitute Gareth Bale scored twice - including a brilliant overhead kick - to win a Champions League final which ended in tears for Liverpool's Mohamed Salah in Kiev. 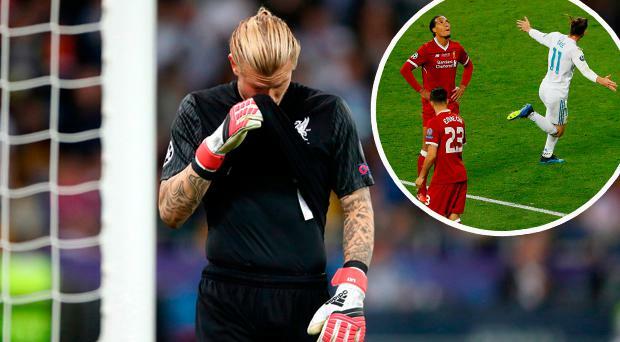 The Wales international, the first British player to score a winner in the European Cup final since Liverpool-born Peter Withe in 1982, produced an influential 29-minute cameo in the 3-1 victory which was a horror show for Reds goalkeeper Loris Karius. Out-of-form Karim Benzema was gifted an early second-half goal when he intercepted a Karius throw, poking the ball into the net - and although Sadio Mane quickly equalised Bale struck twice. The Wales international's first goal was sublime and in many ways reminiscent of his manager Zinedine Zidane's goal which won the 2002 final, but his second was pure comedy as Karius let a 30-yard strike slip through his fingers. It was a devastating blow for Jurgen Klopp's side, who lost Salah to a suspected dislocated shoulder midway through the first half. Madrid benefited to claim their 13th title - and fourth in five years - as Zidane became the first manager to win three successive Champions League finals, with Cristiano Ronaldo lifting his fifth European Cup. It was heartbreaking for Liverpool who had made all of the early running with half-chances for Mane, Roberto Firmino and Trent Alexander-Arnold until the loss of Salah when Sergio Ramos kept hold of Salah's arm as they fell to the ground. Salah remained motionless, left arm outstretched, and despite trying to return eventually departed a couple of minutes later in tears - after a comforting word from team-mate Mane and Ronaldo. There was anger and shock from Liverpool fans inside the NSC Olimpiyskiy Stadium, while Egyptian fans held their breath with a first World Cup match in 18 years just three weeks away. It killed Liverpool's confidence, the tactical reshuffle seeing Mane switched to the right to accommodate substitute Adam Lallana, and encouraged Real, who began to commit more men forward. Real thought they had taken the lead just before half-time when Benzema, preferred to Bale, turned in from close range after Ronaldo's header was parried by Karius - but an offside flag cut short the celebrations. Early in the second half Lallana's miscontrol teed up Isco and although he beat Karius the ball rebounded off the crossbar. Karius was embarrassed minutes later, however, as he tried to quickly release Dejan Lovren with Benzema in close proximity and the Real striker's decision to stick out a boot paid off handsomely with the 51st minute opener. The goal was still being debated when Mane equalised from close range four mintues later, after Dejan Lovren's header from a James Milner corner. Karius turned Isco's shot wide but he was helpless with Real's next effort as substitute Bale produced an unstoppable world-class overhead kick which dropped just under the crossbar in the 64th minute. Zidane stood and applauded and he was joined by thousands of Liverpool fans filling almost three-quarters of the ground who, despite the cruel blow, appreciated the quality. Mane struck the post as Klopp's side rallied, while Andrew Robertson's brilliant last-ditch tackle denied Ronaldo a certain goal which would have ended the match there and then. Karius blocked Benzema's effort as time ticked down but the goalkeeper was at fault once more seven minutes from time as he allowed Bale's 30-yard strike to slip through his hands. Victory was Madrid's - again. Gareth Bale. Began the day a brooding figure having been left out of the starting XI in favour of Benzema and was seemingly absent for much of the warm-up. But once he was given his chance with just over half an hour left he grabbed the spotlight. He had been on the field less than three minutes when he flung himself in the air and summoned a goal for the ages. He then had the bravado to chance his arm from unlikely distance and cashed in on Karius' fragile confidence. Suitors be warned, Bale is not for sale. Defeat for Liverpool took manager Jurgen Klopp's losing streak in finals to six in a row. The German lost the Europa League and League Cup with Liverpool in 2016 having lost two German Cups and a Champions League during his time at Borussia Dortmund. He has tasted success once, though, beating Bayern Munich 5-2 in the German Cup back in 2012. Real Madrid broke new ground in Europe's top competition by naming an identical starting XI to the one which won the 2017 Champions League final against Juventus last year. Five of Zinedine Zidane's seven substitutes were even the same. Theo Hernandez and Lucas Vazquez were the new arrivals, taking the slots of departed duo Alvaro Morata and Danilo. Liverpool: Loris Karius 2, Trent Alexander-Arnold 6, Dejan Lovren 7, Virgil van Dijk 6, Andrew Robertson 8, James Milner 6, Jordan Henderson 6, Georginio Wijnaldum 6, Sadio Mane 8, Mohamed Salah 6, Roberto Firmino 7, : Substitutes: Adam Lallana (for Salah) 5, Emre Can (for Milner) 5. Real Madrid: Keylor Navas 7, Dani Carvajal 6, Sergio Ramos 7, Raphael Varane 7, Marcelo 8, Casemiro 7, Luka Modric 7, Toni Kroos 7, Isco 5, Karim Benzema 8, Cristiano Ronaldo 6. Substitutes: Nacho (for Carvajal) 6, Gareth Bale (for Isco) 9, Marco Asensio (for Benzema) 5.